This post is published to explain – how to install inkscape in ubuntu 10.04/9.10/..with a small tour to introduce with inkscape and it’s features.Inkscape is an open source and free vector graphics editor with the features equivalent to adobe illustrator,coreldraw or xara x by using the SVG(Scalable Vector Graphics) format,the standard vector graphics format defined by W3C.Inkscape also support many advanced SVG features like markers,clones,alpha blending …. in the sophisticated Graphical Interface. Installing Inkscape on Ubuntu 10.04(Lucid Lynx)/9.10/..
#1. Open SPM(System -> Administration -> SPM) and search for “inkscape”. #2. Mark(select ok if asks for dependencies) the necessary packages for installation. #3. Now,click on Apply to begin installation process…and wait until the process complete..
#4. That’s all…you have installed the Inkscape successfully on your Ubuntu Computer. 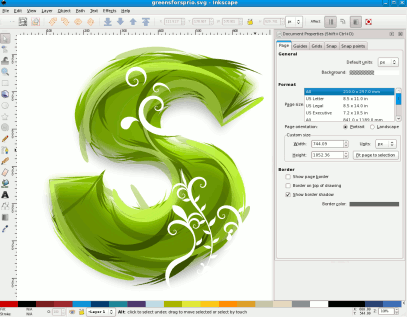 Using Inkscape : Go to Applications -> Graphics ->Inkscape.